Black chalk, pen and ink, gray-brown, bistre, and yellow washes,1 over traces of black chalk, pin holes at some of the angles of the architecture (tempietto) at the head of the baton, 52 (at right edge) x 29.6 (bottom),2 wm., bunch of grapes, similar to Briquet 13065. Inscribed in ink to the left of the head of the baton: L’an mil cinq cens trente sept, le lundi dix huitiesme jour de fevrier, ce present pourtraict a esté signé des notaries soubzsscriptz en ensuyvant certain marché faict par Macé Begault, maistre orfevre à Paris à messieures de chappitre de Paris par devant les notaries soubzsscriptz followed by the signatures of the two notaries of Châtelet Boreau and C. Martin (Fig.D.73d).3 On the verso are two indecipherable numbers or letters (according to Béguin,1988 , 8). PROVENANCE: Paris, Bruno de Bayser. Béguin, 1988 (1989), and Figs. 1, 2, 12, as by Rosso. 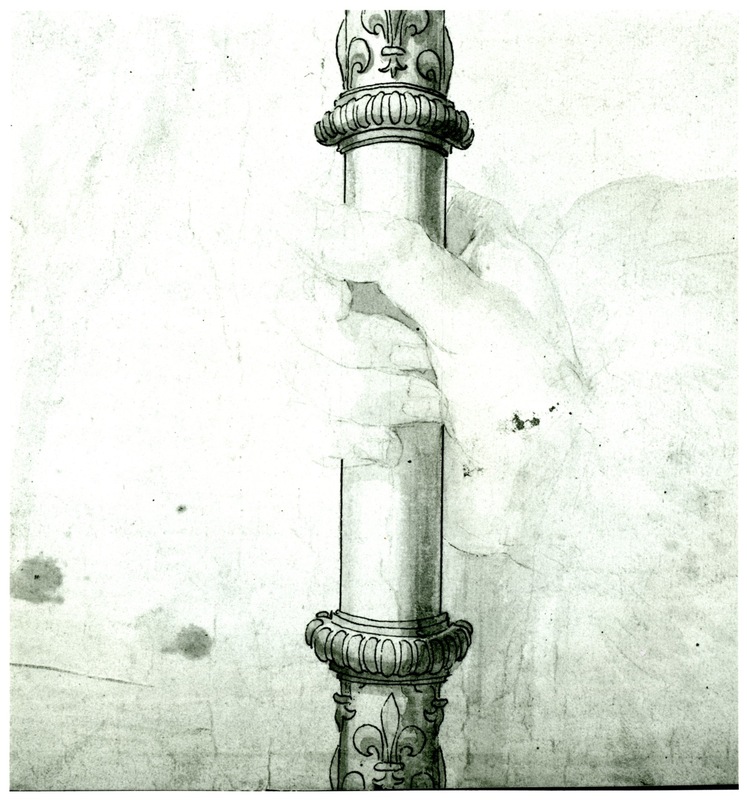 Grodecki, 1988 (1989), proved that the drawing was the model for a baton made for the Chapter of Notre Dame early in 1538 on Rosso’s design and which can be found in the inventories of the chapter until the end of 1791. This large drawing (Fig.D.73a), which I know only from photographs, is a model for a cantoral baton in the actual size of the work that, according to the inscription, was to be executed by the goldsmith Macé Begault for the Chapter of Notre Dame in Paris. The image is slightly cut at the top but more extensively, it would seem, at the bottom, where much of the baton below the hand is missing. The inscription of February 18, 1538 (new style),4 mentions an agreement that had been made with the goldsmith for the execution of this baton, but which has not survived among the papers of Claude Martin. 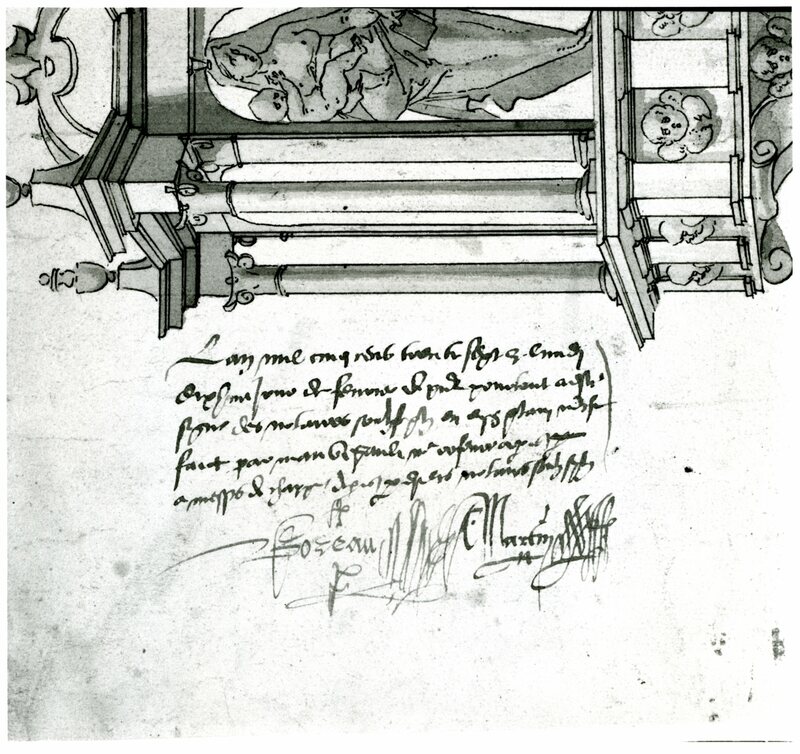 This agreement was made sometime after December 14, 1537, when the chapter decided to have the baton made (Grodecki, 1988 , 17, 29, n. 1) and the date on the drawing. The decision was made only three months after Rosso had become a canon of the Chapter of Notre Dame. 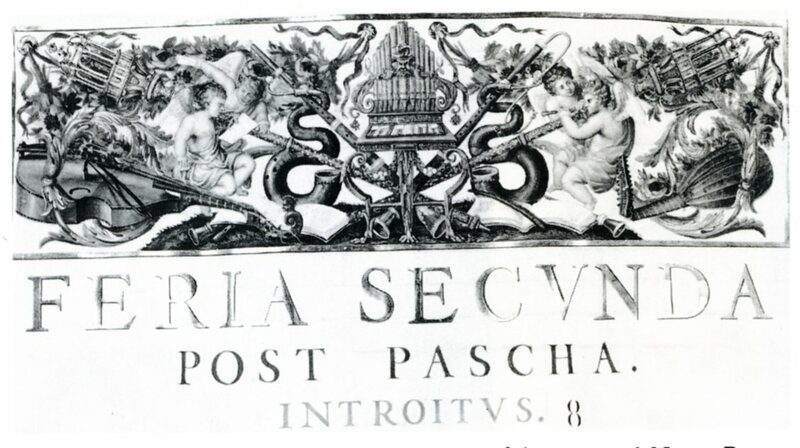 The style and the details of the baton and the draughtsmanship of the drawing indicate that the drawing is by Rosso, as Béguin argued. The context in which the drawing was made and the baton actually executed, as thoroughly presented by Grodecki, supports this attribution. 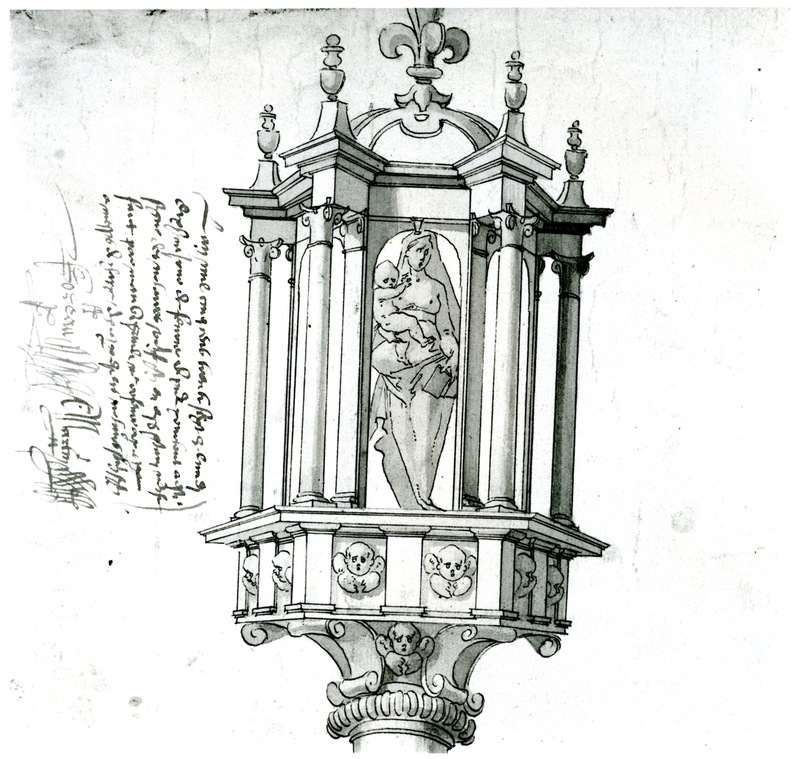 The architectural details of the little temple or baldachin that encloses the statue of the Virgin and Child (Fig.D.73b) are virtually identical to what appear in Rosso’s Design for an Altar (Fig.D.38a). The composite capitals are similarly very plain [as distinct from their elaborated and finished appearance in Alberti’s engraving of the Altar drawing (Fig.E.4a)]. Both drawings are executed in the same rudimentary fashion of simple outlines and a few broad washes to serve as clear models for sculpture. 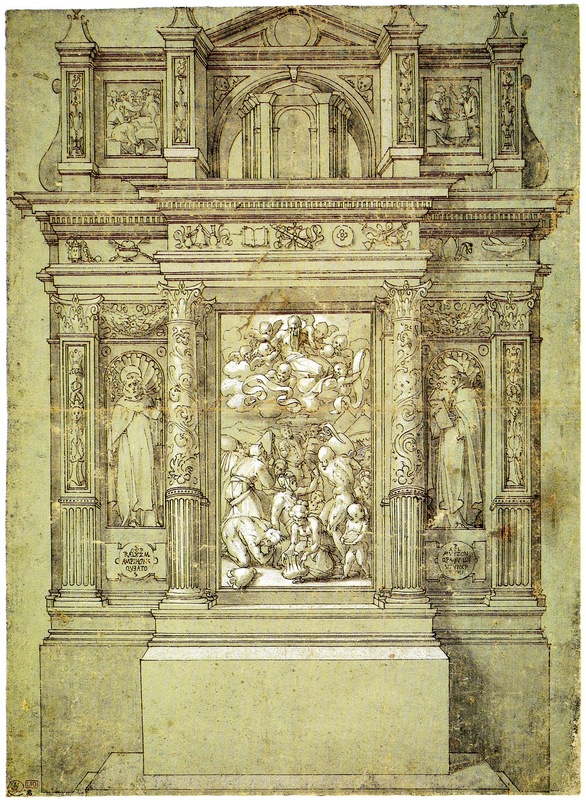 The draughtsmanship of the Baton is also similar to that of Rosso’s Design for a Chapel (Fig.D.37a). In all three of these drawings, the “statues” are drawn in the same simplified manner, and the Christ Child in the Baton drawing has the same bald pointed head that is found in the other drawings. An apparently bare-breasted Virgin is also found in Rosso’s Annunciation known from a copy in Dusseldorf (Fig.D.83). Given the kind of modello that it is, the drawing gives every appearance of being an autograph work by Rosso. 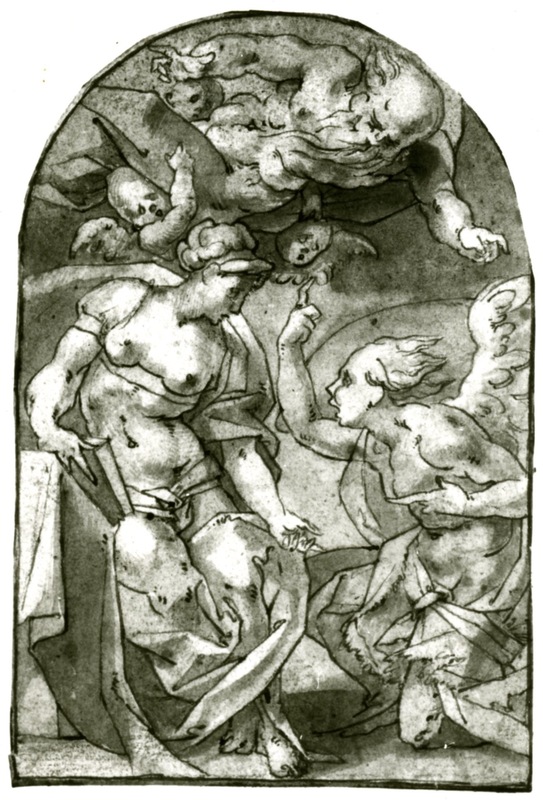 The drawing would have been done after December 14, 1537 and before February 18, 1538, and probably in January or early February of 1538. Two weeks later, the clerk of Notre Dame was authorized to pay the master goldsmith and the gilder for their work (Grodecki, 1988 , 17, 23, n. 3). But while in the inscription on the drawing, the master goldsmith is given as Macé Begault, in the authorization statement he is named Nicolas Maire. The gilder’s name is given as “Matheo Begault.”5 Grodecki stated that this authorization indicates that the baton must have satisfied the four men who were asked to evaluate it on April 15. 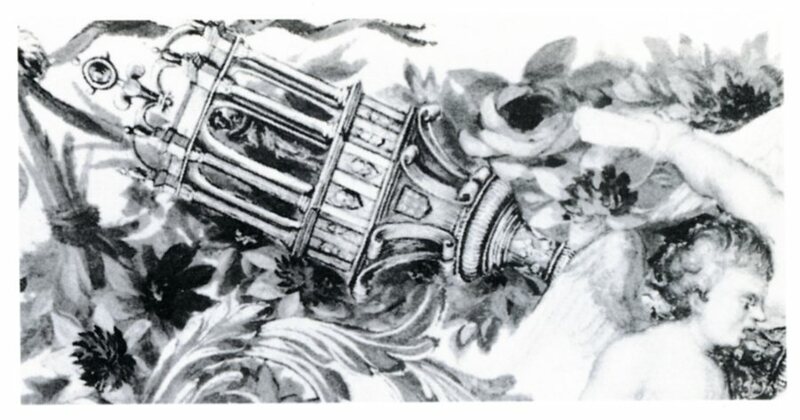 What, however, cannot be known is how closely the silver gilt baton resembled the model presented by Rosso’s drawing. The baton was between 1.30 and 1.60 meters long, composed of the staff and the crowning element, an open tempietto containing a statuette of the standing Virgin and Child. The baton was the sign of the dignity of the chorister (chanter) of Notre Dame, who, after the Dean, was the most important dignitary of the Chapter of Notre Dame. In 1538, the chorister was Martin Ruzé, whose name, however, does not appear in any of the documents related to the baton. The baton is listed in the inventories of the Treasury of the chapter from 1538 until 1790. It seems to have been melted down along with most of the other treasures of the chapter in 1791. In the 1539 inventory, it is described as surmounted by a fleur de lys; a fleur de lys is at the top of the tempietto in Rosso’s drawing. But in the inventory of 1626, it is described as surmounted by a false colored stone, which in 1790 is said to be red. Grodecki believed that this colored stone replaced the fleur de lys, but from a picture of the baton of 1669 (see below), it seems that the stone replaced only the uppermost part of it. 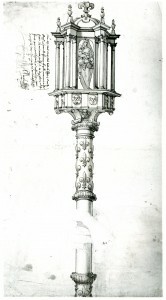 Of the several representations of the baton, the best, as pointed out by Grodecki, appears in color as part of the decorative band at the top of a page of a large choir book painted in 1669 by Étienne Compardel (Fig.Compardel; Fig.Étienne Compardel) in the Musée Notre-Dame (Grodecki, 1988 , 21, Figs. 4-5). Here it is depicted twice for the sake of the symmetry of the design. Although the painted batons are clearly related to that of Rosso’s drawing, they are not identical to it. What cannot be known is whether these differences are those seen in the actual baton. Among various possibilities, the design could have been slightly altered by Rosso himself before the goldsmith executed it, or the design could have been altered by the goldsmith. Compardel may also have made changes. The proportions of the painted tempietto are more squat, while the supporting element beneath it is taller. In the miniature the arches of the tempietto spring from immediately behind the urns above the piers; they are set farther back in Rosso’s drawing to form a less airy canopy than appears in the seventeenth century depiction. The Virgin carries the Child in her left arm and there is no indication of a book. The knob at the top of the staff has a different design. Furthermore, there is no unadorned area on the staff where in the drawing appears the hand that grasps the baton. But in the miniature the end section of one of the batons can be seen with its terminal ring and point. Grodecki pointed out that the single angel head beneath the base of the tempietto is replaced in the miniature by a small enameled shield, blue with nine gold spots, which, although impossible to identify, are probably fleurs de lys. The arms are not those of the chapter or of Martin Ruzé. Grodecki thought it might be a royal shield and hence indicate that the baton was originally partly paid for by the crown. Of course, it is possible that this shield is a replacement for the angel’s head, perhaps made when the fake ruby was added to the top. I am inclined to believe that Compardel’s batons, while based on the baton as executed, are not as faithful a representation of it as the finesse of the miniature might incline one to think. Their proportions are especially wrong. 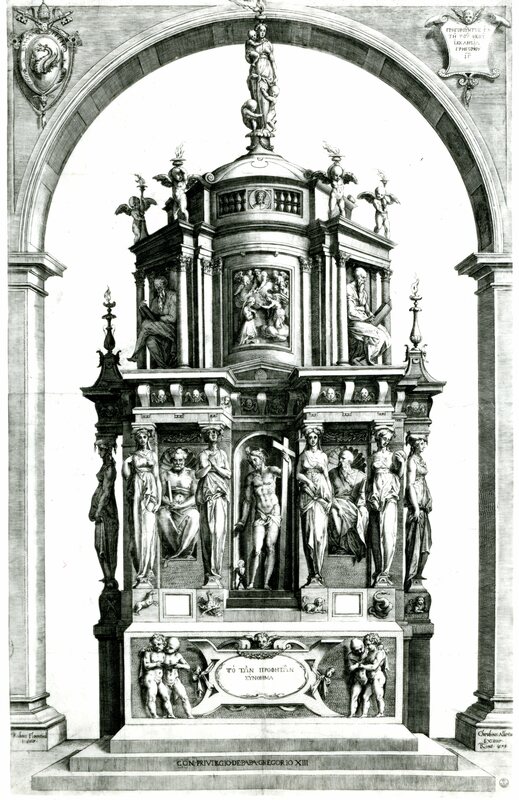 However, the canopy of the tempietto is similar to what appears in the depiction of the baton on a wood relief of the decoration of the choir stall (Fig.Choir stall relief) that was made at the beginning of the seventeenth century (Grodecki, 1988 , 21, Fig. 6, 22), suggesting either that the image of the relief was derived from Compardel’s miniature, or that at some time before 1668 the original canopy of the baton was remade as it appears in that painting. This could have been before 1626, by which time the fake ruby appeared at the top. The armorial shield could also have been added then. 1 Béguin, 1988 (1989), 10, stated that the yellow wash was placed where the silver baton was to be gilt. 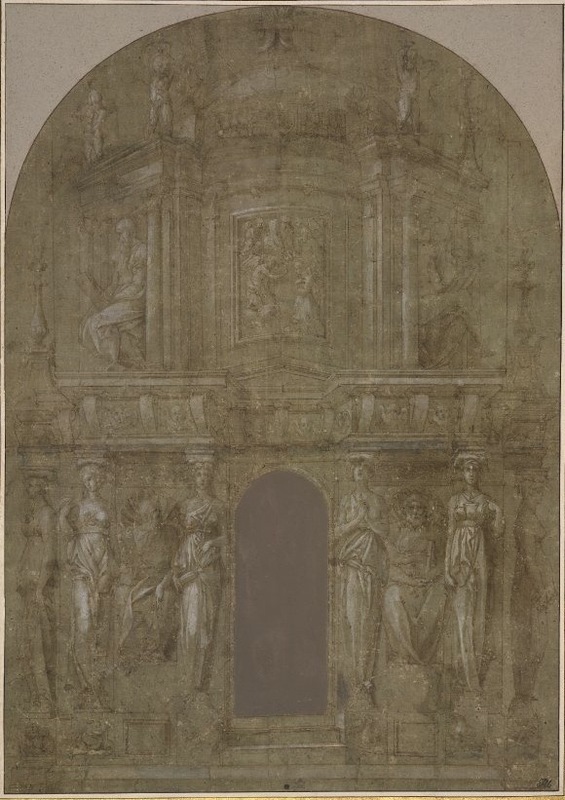 2 More specifically on the execution of the drawing: the hand and sleeve are drawn in black chalk with a pale gray-brown wash, but faint traces of black chalk are also found in the upper part of the drawing; the yellow wash to indicate gilt, apparently, is found on the ornamentation of the shaft, on the cherubs’ heads, on some of the architectural elements of the baldachin; on the Virgin and Child, the yellow wash is mixed with the gray-brown wash. Béguin, 1988 (1989), 8, said the drawing was pricked, but she may be referring to the pin holes found in the “tempietto,” which were probably not for the transfer of this image but for the transfer from another perspective drawing by Rosso made in preparation for the finished drawing. 3 From Grodecki, 1988 (1989), 17. George A. Wanklyn informed me that the principal notary is Claude Martin and that Boreau is another notary acting as a witness. The latter is either Jean Boreau (active 1516/1517-1544) or Claude Boreau (active 1534-1588), both of whom appear in the documents pertaining to Rosso’s activity published by Grodecki in Grodecki, 1975. Grodecki, 1988 (1989), identified Boreau as Jean Boreau, and Claude Martin as the notary attached to the chapter and the primary signer on the drawing. 4 For another contract drawing of this type also to be used by Macé Begault and three other Parisian goldsmiths, see George A. Wanklyn, “Le présent offert à Henri II par la Ville de Paris en 1549,” RdA, 46, 1979, 25-30, and Béguin, 1988 (1989), 8-9, 16, n. 11.